When it comes to online casinos for Australian gamblers, few can compete with Joe Fortune. The casino is exclusively available to AU players. Joe Fortune was launched in 2016 when gambling laws in Australia led to certain casinos pulling out of the AU market. The need for an Aussie exclusive casino arose, and Joe Fortune certainly delivered. Imagine wagering and winning in AUD, without worrying about the cost associated with converting currencies. While Joe Fortune is relatively new to the online casino scene, the software powering its games is not. You will find games provided by industry giants Microgaming, Rival, Real Time Gaming, iSoftbet and more, all with SSL encryption to ensure your data is safe and secure. Joe Fortune casino is owned by Haydock Sports Limited Casinos and is licensed in Curacao.We are beyond thrilled to add Joe Fortune to our list of top AU casinos. Check out our review below and see why Joe Fortune made our list! Play the best casino games from multiple gaming providers like Realtime Gaming, Betsoft and Rival. The casino offers more than 400 casino games for real money and in free play mode. In the games lobby, you will find Joe’s picks for you – which include a mix of the games on offer, new games, speciality games, classic table games and live dealer casino. If you’re a fan of table games, you can look forward to a variety of them and their versions each providing amazing winning opportunities. Test your gambling skills in a round or two of blackjack, baccarat or roulette. Joe Fortune has some fantastic, value-packed bonuses for you to enjoy and to help boost your bankroll. All new Joe Fortune players are entitled to a 100% up to $1,500 welcome bonus when you make your first deposit. A bonus of up to $1,000 is all yours when you make your first deposit via credit card or up to $1,500 if you choose to use Bitcoin or Bitcoin Cash. The bonuses do not stop there because Joe Fortune will also match your second deposit 100% up to $500 when you use a credit card to deposit, or $750 for Bitcoin and Bitcoin Cash deposits. Both of these bonuses have a 30x playthrough requirement before you can use any other bonus. It is also worth noting that not all Joe Fortune games are equal when it comes to meeting the wagering requirements of the bonuses. You can also grab a bonus up to $50 on the first deposit you make each day and a weekly bonus up to $150 once you become a Gold member. Like the welcome bonuses, these daily and weekly bonuses have a 30x playthrough. If you love what you see at Joe Fortune, tell your friends about it because you will receive $50 for every person you refer to Joe Fortune and they also receive a free $50 and are eligible for the welcome bonuses mentioned above! Funding your Joe Fortune account can be done by credit card or Bitcoin. As you would expect from any business, there are some deposit limits in place. For Visa and MasterCard there is a minimum deposit of $20 and a maximum of $1,000 for new players. Once you have a history with Joe Fortune, these deposit limits can be increased. Withdrawing from Joe Fortune is easy to do, so you should have no problems getting your hands on your winnings. You can withdraw via Bitcoin, Check by Courier, Bank Wire and credit card. Again, there are some withdrawal limits in place. Bitcoin withdrawals have a minimum of $10 and a maximum of $10,000 while checks need to be between $20 and $3,000. If you are withdrawing to your credit card, the least you can withdraw is $20 and the maximum of $2,400. Bank Wires are reserved for big withdrawals of between $1,500 and $9,500. 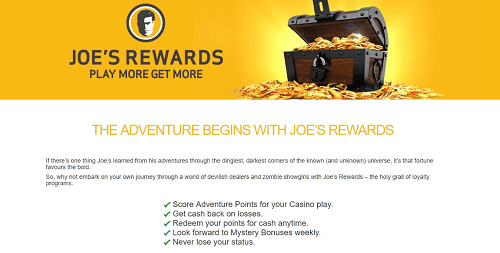 Joe Fortune players are limited to one withdrawal method every seven days, although Bitcoin users may request one withdrawal every three days. All withdrawal requests begin being approved after 24-hours. Once approved, checks take approximately four to seven business days, bank wire transfer will hit your account within 5-10 business days and credit card withdrawals take 4-7 business days. Bitcoin is the fastest withdrawal method with funds process approximately 15-minutes after being approved. Given the nature of the online casino environment its only natural to be concerned about your safety. However, you can rest assured the Joe Fortune casino will never compromise your safety; in fact, the casino employs the high-level encryption technology. This technology, 128-bit SSL encryption, ensures that your personal information is protected from hackers. The casino is frequently audited by industry regulatory bodies to ensure that the service offered is secure and legal. In addition, all casino games make use of Random Number Generator (RNG) to ensure that Joe Fortune casino does not unfairly benefit from your real money wagers. Joe Fortune also has a live dealer casino that you must check out when you get the chance. As the name suggests, these games are dealt via a video feed to an actual human dealer, giving you the full casino experience from the comfort of your own home. Baccarat, early payout blackjack, Super 6, roulette and blackjack are available in the live casino with multiple tables for players looking to jump off a cold dealer. On the rare occasion that you encounter a problem while playing at Joe Fortune, you can try to answer your own query via the FAQ page. If the FAQ page does not contain the answer to your issue, click the “Contact Us” link near the top of the page to open a contact form. Queries posted on this contact form will be answered by an agent within 24-hours. If you require a faster response, the contact form also has links to a live chat facility and also details the Joe Fortune contact phone number (1800 989 024). As an online casino that services Australian gamblers only, it certainly won over our review team. You are guaranteed an authentic Australian gambling experience when you sign up for Joe Fortune casino. Everything about this casino is tailored and created specifically for Aussie gamblers, and we give them four out of five stars. Ready to move up in the gambling world? Sign up today and claim your welcome bonus worth AU$1000!